Mose Menard was born in August of 1859 in Belle River, Ontario. His father owned a Blacksmith shop, where he began working at the age of 14. After working for two years with his father, Mose left to apprentice with Alfred Pulford, a wagon maker from Ruthven. Through wise investments and working with Mr. Pulford, Mose was able to launch his own business in 1902 called Menard’s Windsor Carriage and Delivery Wagon Works, where he soon became the largest wagon dealer in Essex County. Taking notice of the growing auto industry in Detroit, Mr. Menard started dabbling with internal combustion engines and soon hired a Detroit engineer to design a car for the company to build. Mose advertised himself as “the Father of the Canadian Car” and promoted the idea of Windsor-made automobiles. 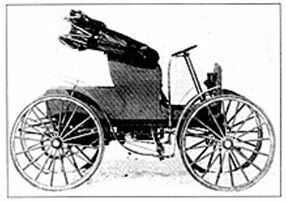 His “Autobuggies,” as they were called, were crude but solidly built and ran well. They were fairly successful for a while, especially in Quebec and on the Prairies. By 1910, he was facing increasing pressure from Ford, so he switched his product to trucks and the Menard Motor Truck Company was born. Within a few years, Menard had a full line of trucks, and even built fire trucks for the Walkerville Fire Department. Having worked for 46 years, Mr. Menard sold his company in 1920 and became involved in politics, becoming Mayor of Riverside in 1923. He passed away January 14, 1946 at the age of 86. Colling, Herb. Pioneering the Auto Age. Tecumseh, Ontario: Travelife Pub. Enterprises, 1993.